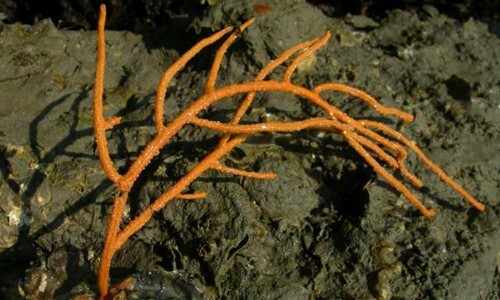 Grows in thick clumps on rocks, piers and pilings in shallow waters. Also found on wrecks and oyster reefs in deeper waters. Found in the middle and lower Chesapeake Bay. The red beard sponge grows to 8 inches tall and 12 inches in width. It varies in color from orange to bright red and has thick, intertwining branches and small, scattered pores. Red beard sponges are filter feeders that feed by drawing water through their pores into their chambers. Beating, hair-like cilia capture food particles in the water and unused water and waste products exit through another opening at the top of the sponge. These sponges reproduce both sexually and asexually. Asexual reproduction takes place when branches are damaged or broken off. The sponge fragments bud into new sponges. During sexual reproduction, eggs are fertilized within the sponge. 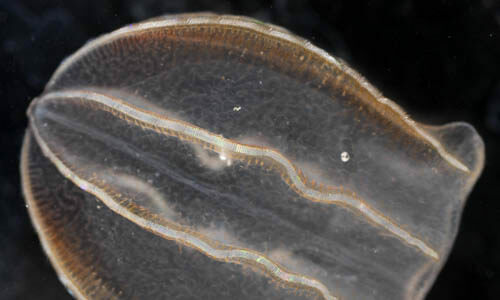 Free-swimming larvae eventually settle to the bottom, where they find a hard surface to attach themselves to. Young sponges are usually thin and flat, rather than thick and branching. Sponges are animals, not plants. Red beard sponges are the most common sponge in the Chesapeake Bay. Red beard sponges cannot survive if taken out of water. 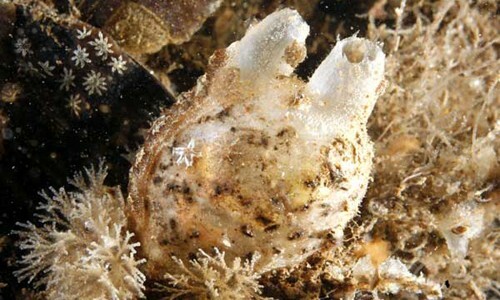 The nooks and crannies within sponges provide important habitat for shrimp, worms, crabs and other small Bay creatures.